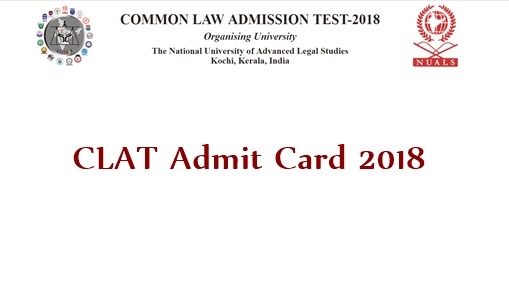 CLAT Admit Card 2018 Download : CLNU has today, i.e on 20th April released the CLAT admit card 2018 for all aspirants applied for the examination on 13th may 2018. Hence all the applicants can download the CLAT Hall ticket 2018 from the official website, clat.ac.in. Candidates can download and preserve the hall ticket safely to carry to the examination. Admit card is the most important document to show in the examination centre. All the hopefuls applied for CLAT examination 2018 must show the admit cards at the time of verification at the examination hall. If Candidates fail to show the admit cards, they will lose the chance to write the examination. Candidates, those who are attempting the CLAT examination this year can check the complete details of CLAT hall ticket download process, and other important guidelines for CLAT examination from the following article. CLAT is the online competitive examination conducted by CLNU every year for aspirants seeking admission into various bachelor’s and master’s Law degree courses. Students interested in Law courses used to attempt this examination every year. Candidates qualifying this examination will only get admission in LLB and LLM courses. Annually the competition is raising for the CLAT examination. Competitors those who get the best ranks will be given top priority in admissions. The Chanakya Law University, Pune has scheduled the Common Law Admission Test (CLAT) examination on 13th May 2018. Hence the examination date is nearing, all candidates are supposed to download the admit cards from the official website of CLAT, clat.ac.in. Candidates can check the date, timings, and venue of the examination from the hall ticket. The clear address and date will be specified on the admit cards. Also, candidate’s name, register number, date of birth, signature, and photograph will also be printed on admit card. After downloading the admit card, aspirants can check all the details keenly from the admit card. Candidates those who are not aware of downloading the CLAT hall ticket can check the CLAT admit card downloading process from the following steps. Initially, candidates have to visit the CLAT Official page i.e clat.ac.in. After that go to CLAT Login page and enter the details of Candidate login information such as username and password. The CLAT 2018 Hall ticket will be downloaded. Save the Hall ticket soft copy and take a printout to carry to the examination centre.